Hygrostat menjaga kelembaban dalam sebuah ruangan agar selalu stabil sesuai kebutuhan. 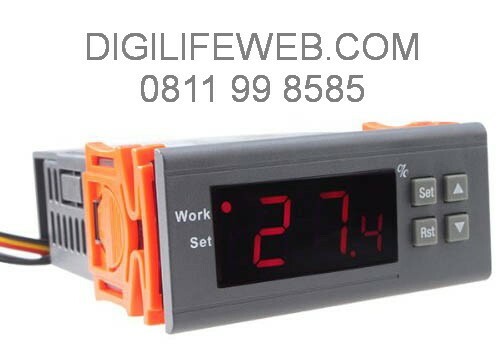 This digital humidity control controller WH8040 is with wide humidity measuring range and controlling range, comes with a humidity controller sensor probe with cable and a temperature sensor probe with cable. Humidity measuring range is 1% ~ 99% RH and control range is 1% ~ 99% RH. RST: Press key RST to switch satrting up and power off, on the condition of power off, it can start up when press key RST, on the condition of starting up, it can power off when press and hold the key RST for three seconds. SET: Press key SET to enter settings of humidity control, and press key ? or ? to adjust. Press and hold key ? or ? for three seconds to enter the fast adjust mode. Press key SET again to exit setting mode. I am sure it the right thing you need now. Don't hesitate, bid now and never miss it. You will receive a parcel contains as below.